Yesterday was a beautiful Autumn day for the Pacific North West, and I had the luck of being able to spend it at not one but two local wetlands locations. I started out at Smith & Bybee Wetlands in Northeast Portland. This is a great spot for anyone, of any experience level. The trails are mostly flat, and the entire loop is roughly 1.5 miles round-trip. You can go for a quick walk, or easily spend a couple of hours stopping along the way (including at two bird blinds/look-out points). Normally I like to try and be out around sunrise, for both great morning light and active wildlife, but I didn’t get started until a couple of hours later this time. Turned out, that was alright. I still saw a great deal of activity here. Frogs were plentiful, and the turtles were out basking, but I was – of course – after birds. I was not disappointed. At one of the bird blinds (looking out over Bybee Lake), I met another birder who rattled off more information in the five or so minutes we talked than I could have possibly retained. He’d seen more birds that morning than I do in a full day sometimes, and many were ones I haven’t seen at all! While he shared his sightings from around the wetlands and we talked about our cameras, we were constantly scanning the many, many birds out in front of us. The one downside with Smith & Bybee is that the water levels are quite low, meaning the water birds are pretty far away. I could use the practice of capture scenes versus portraits, so it was a great stop. 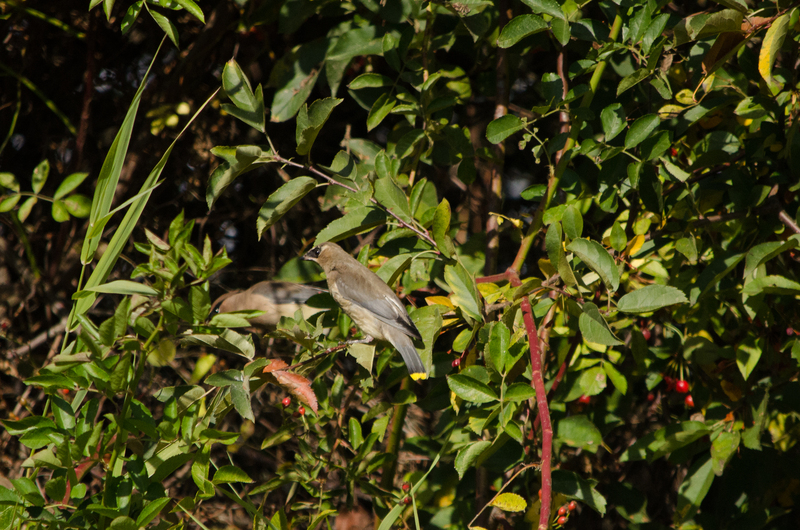 On my way back out of the wetlands, I stopped to watch several cedar waxwings feasting off some bright red berries. Last year, I could not find a single one of these birds, this year, I feel as if they are everywhere! The dark eye mask, splashes of bright yellow, and dabs of waxy-looking red on their wings make them look almost tropical. Most of these birds lacked the last feature, the red feathers that give them their name, which indicates they are still young. They were certainly energetic, and rarely stopped moving. Still, I managed to snag a couple of shots. 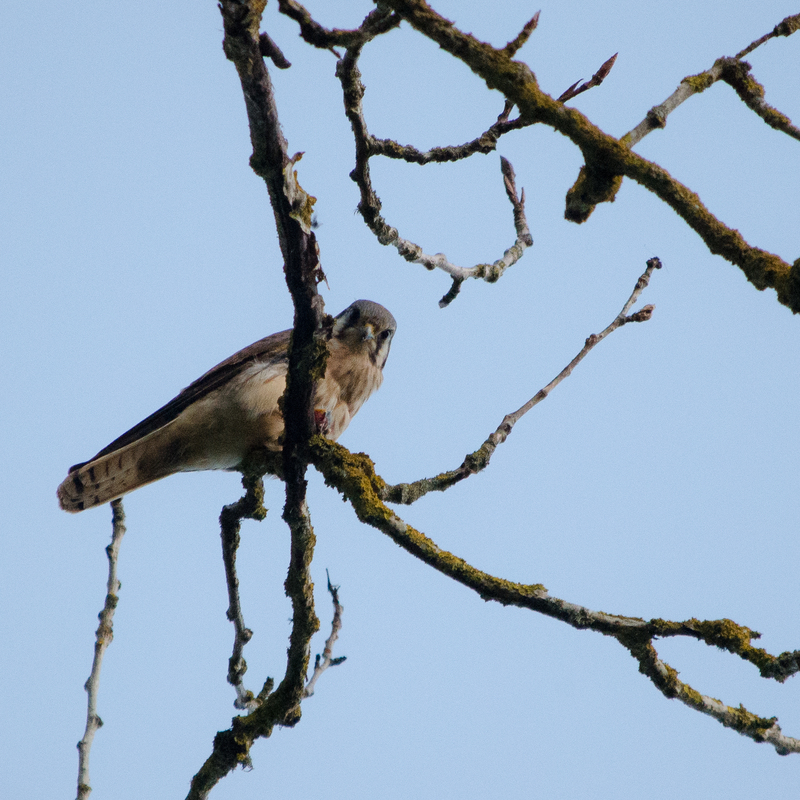 After my late morning venture, I headed northeast, into Washougal and – after recharging at a coffee break with my mom – on to Steigerwald National Wildlife Refuge. This is one of three such refuges in the Columbia River Gorge, but the only one regularly open to the public. The trail is about three miles round trip, although a segment is closed to project migrating birds after October 1st (I forgot about that until I was there, drat!). This is another fairly flat trail, being located in a flood plane; it crosses through a variety of terrains in such a short space, include white oak stands, open fields and meadows, and of course wetlands. It meets up with a multi- use trail which runs along the Columbia River, and I do recommend venturing along this path a ways as well for some fantastic views. The first half of my walk here was pleasant, yet very quiet. 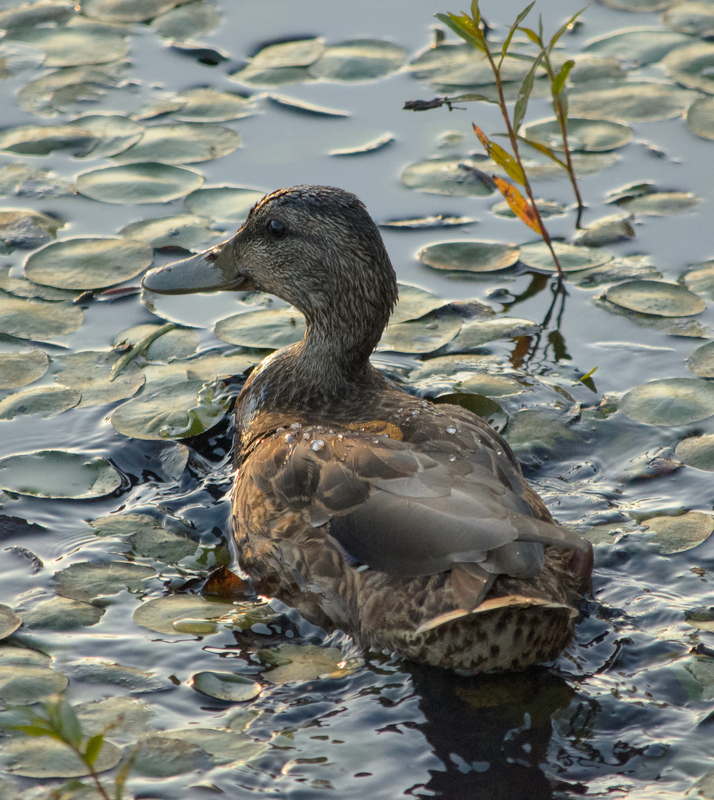 It was late afternoon and most wildlife was out of site, with the exception of a distance doe grazing with her fawn, and the turtles and bullfrogs out sunning themselves among the lily pads. The second half, however, as I looped back around turned out to be quite active! 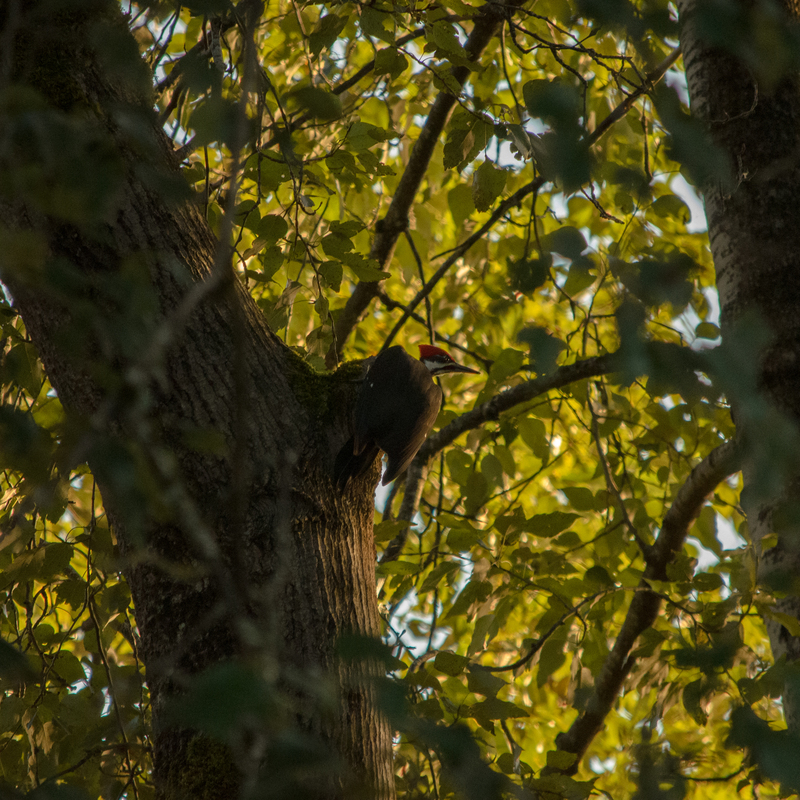 One of the definite highlights was spotting my 95th bird of the year – a pileated woodpecker. A couple of other birders I had met on my walk in had let me know they’d spotted the bird earlier but it had been at least an hour since then. 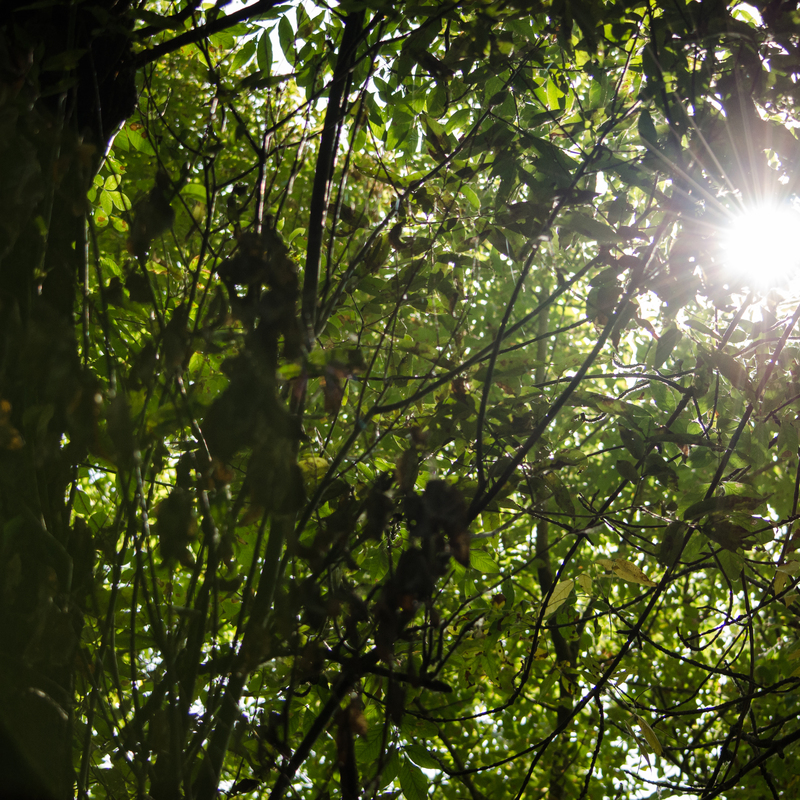 As I walked along the Columbia River back towards the trail through Steigerwald, I heard the call and started scanning the trees. This little bugger moved fast, quickly darting from tree to tree among the shadows and rarely staying put for long. Still, I managed to keep up and snag a few shots so that I could add him to my count. That definitely made my day! One thing I always find reliable about Steigerwald is a chance to see birds of prey. Although I had seen the pileated woodpecker, I was feeling a bit disappointed as I started my return trek that I had not yet seen any raptors on this walk. I should know to be more patient. As I headed along the lake, I caught a glimpse of gray wings and hurried my pace. A male Northern harrier had made an appearance, and I made my way to a lookout point just at the right time to watch him harass several ducks. He made a few passes but his talons remained empty. 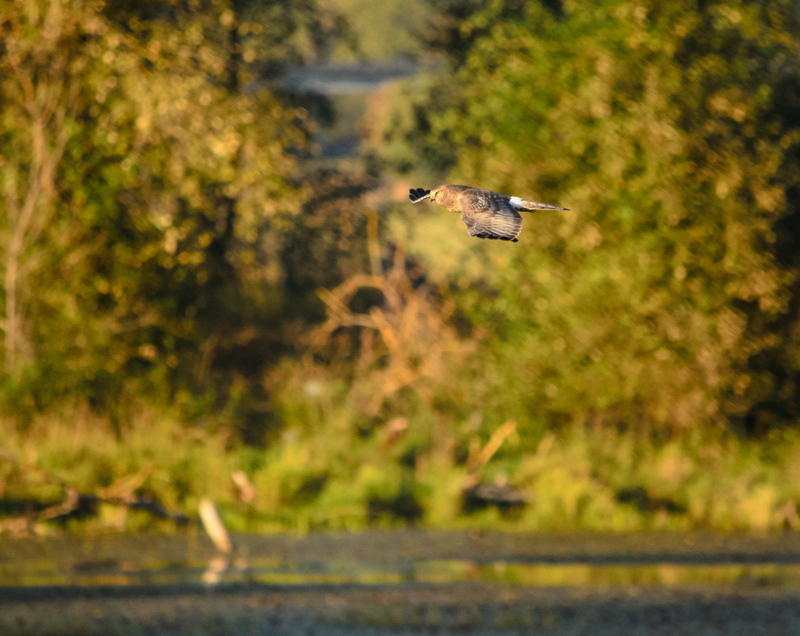 My camera was on rapid-fire as I tried for a well-time flight shot. Feeling a bit better about my luck, I was reflecting on how nice the crisp air felt as the sun set. I took a few more opportune shots of ducks and geese coming in to roost at the lake for the night and crossed through the white oaks on towards the final stretch of trail. Something made me look back over my shoulder, and I almost tripped. An American kestrel (a small falcon) had stopped just behind and directly above me to enjoy what looked to be a field mouse dinner. He didn’t seem to mind me at all, and so of course I put my camera to work. 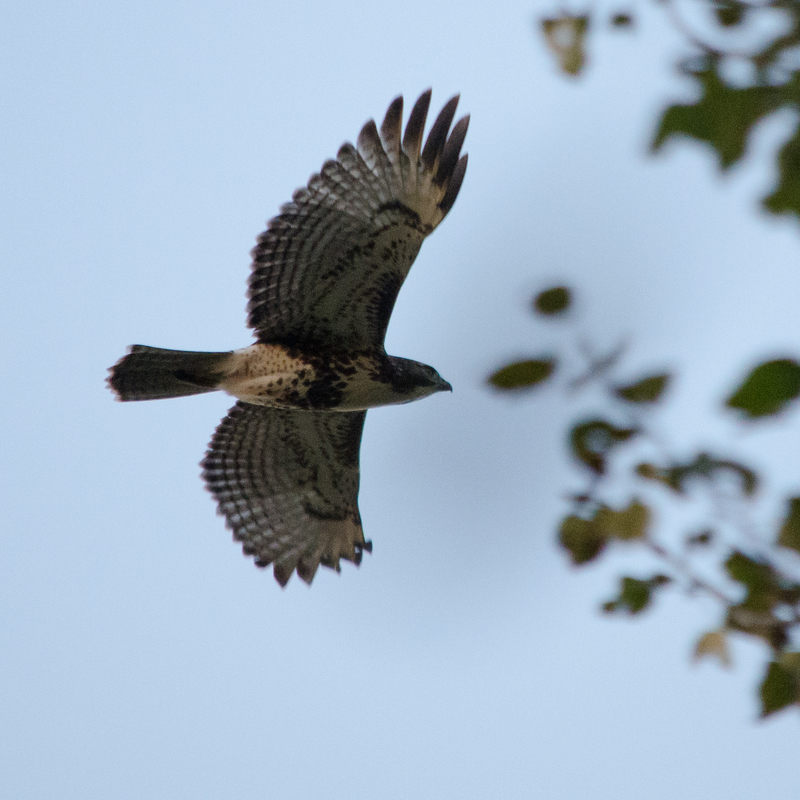 While this was going on, a red tailed hawk cruised by. A single snap of the camera was all I had time to get. Looking back through the pictures I brought home, I can’t help but feel that the day was successful. These two locations are ones I enjoy visiting year-round, and I’m already looking forward to my next visit. If you would like to see more pictures from my day, please be sure to visit my Flickr feed!